One of the great things about throwing an AHS-themed soiree (besides the fact that it's a FANTASTIC Halloween theme!) is that you have 5 (and the beginning of 6) season themes to work with. Choose your favorite: Murder House, Asylum, Coven, Freak Show, Hotel, or Roanoke to base your theme on, or mix them up for extra fun! 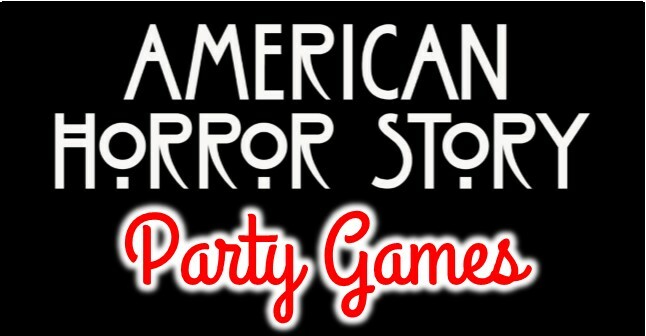 Classic Halloween games are perfect for an American Horror Story party, no matter what time of year you indulge yourself and your friends. You can even throw a Binge Watch long-weekend, and check out every season from the beginning while playing games and serving food like blood red velvet cake, body part candy, and drinks like eyeball jello shots and Hotel bloody mary "IVs"! You can take almost any game and turn it into an AHS activity with a little creativity. If you're lucky enough to live in an area with a tradition of haunted houses (New England and the south seem to be great for this, but most history-rich areas have them), take your guests on a tour, one run by professionals or make your own. If you don't live in a good place for that, or if you want to stay closer to home (especially if there's alcohol present), set up your own "Murder House" prop areas for things like games, food, drinks, and goodie bags. Dressed up in your favorite freaky costumes (from Freak Show or any American Horror Story season! ), have guests perform a skill of their choice, or fill a bowl with creepy dares that players have to execute. Judge who is the scariest or most entertaining and hand out prizes! American Horror Story is rich with trivia: about the places where each season takes place, the historical facts and legends referenced in the show, plus the characters and plot! There are tons of resources online to provide all kinds of information to challenge the most die-hard AHS fan! Bobbing for apples is a Halloween tradition. In season 1 of American Horror Story, one of the Murder House's victims was involved in an unfortunate incident with the Rubber Man and a tub of water and apples. Add your own bobbing to the fun. Since this is an adult party, you can fill the tub (making it a claw footed bath tub would be even better!) with sweet liquor, preferably something red like sangria. Be careful not to actually submerge your face in the liquor. It's actually more fun and challenging to try to get the apples that way! which coven witch is which? Have the magic talents of all the Witches from Coven in a bowl, tin, or jar, and have each guest draw one. They then have to do a charade-style demonstration of their talent, and others have to guess what the talent is. To make it really challenging, have them guess which witch the demonstrator is portraying! Have each guest receive a sticky note with an American Horror Story character's name on it, and have someone put it on their back. They then have to go around the party and ask other attendees questions to help them determine who they are. An alternate In Character game is to have each guest draw an AHS character's name from a hat or jar, and they then have to act like that character through the rest of the party, or pay some kind of fun and embarrassing penalty. If you have a pool and are lucky enough to live somewhere where it's warm when you're having your party, you can go to your local pool supply store (or find one online) where they will more than likely carry bottles of pool dye. Turn your pool water red and swim in an ocean of fake blood. Lady Gaga did this for a huge American Horror Story: Hotel party in 2015. Cool and creepy! Whomever is "it" is Thomasyn White, the ghostly leader of the Roanoke colony. Everyone who gets found and caught becomes a dead villager, spreading the evil to others until there is no one left! Have a bunch of fake plastic cleavers, and every time someone becomes a dead villager, they get one to use to tag with! Make classic creepy sensation boxes that represent different body parts, like a turkey leg, a ham, cold cooked spaghetti, or peeled grapes for eyeballs. Boxes can come from old empty shoe, cereal, or tissue boxes. Make bingo cards with all the different body parts. Whoever gets complete columns or rows correct gets a prize! The person who guesses the most boxes (or all of them!) gets a special prize! It's a challenge to think of any TV series better for party gore and scares than American Horror Story. From a house that kills its owners, to a terrifying freak show, New Orleans witches, and a faux documentary about the Roanoke colony in Virginia, AHS presents some of the most creative horror ever presented on television. If you want your party, Halloween or otherwise, to a have a truly dark and gruesome ambiance, the 6 seasons of American Horror Story are rich sources of ideas!